Headlight development now uses LED chips with micro-structured pixels, which can shine, or be turned off individually. The high resolution systems now use 84 pixels to more than 1000 pixels. 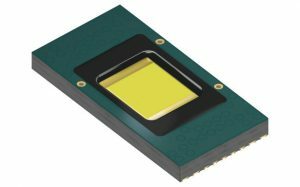 The development of the world’s first hybrid LED, based on the conclusions from the FMER-project μAFS led by Osram Opto Semiconductors, supports these higher resolution multi-pixel LEDs which can be scalable to 1024 pixel in a die measuring 4 x 4mm. The technology will go into production in 2020. Eviyos is the first prototype of a hybrid LED that combines a light emitting diode array chip and an individual silicon pixel control IC. Several thousand LEDs in the Eviyos, each measuring 0.125 x 0.125mm, receive their brightness and current setting from an electronic control unit merging various sensor information and the camera input. The camera captures the information about the surrounding environment, and forwarding it to a DSP controller. In the μAFS research project a group of German companies worked for three and a half years until September 2016 on the groundwork for a new class of adaptive front lighting systems achieving several thousand light segments based on energy-efficient highly integrated LED headlamps. “With the first commercially-viable multi-pixel LED for smart headlighting in automotive vehicles, we hope to help improve safety records as well as make driving a better experience, with much more control in the driver’s hands,” said Stefan Groetsch, applications specialist at Osram Opto Semiconductors.